Cornwall's South Crofty tin mine could restart production in five years. The mine was opened as a tourist attraction for the first time over the weekend. But managing director and mine manager Kevin Williams, said tourism was "a stepping stone to getting the mine back to production". 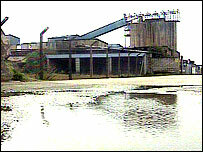 South Crofty was the last working tin mine in Europe until it shut five years ago. Mr Williams said: "We are looking to starting mining again, but it takes a long time to plan and we do not want to make mistakes." The closure of the mine, which has been owned by Baseresult Holdings Ltd since 1991, ended a 3,000-year-old mining tradition in Cornwall. But Mr Williams said the firm planned to use a "totally different mining method which would dramatically cut costs". He added that the price of tin was "very favourable". Tourists wearing miners' helmets and lamps can now see workings which were last mined in the 1920s. Hundreds of people were employed at the 1,200ft-deep mine, with its 300 miles of tunnels and workings. Two of the old workforce have returned, to show visitors round.